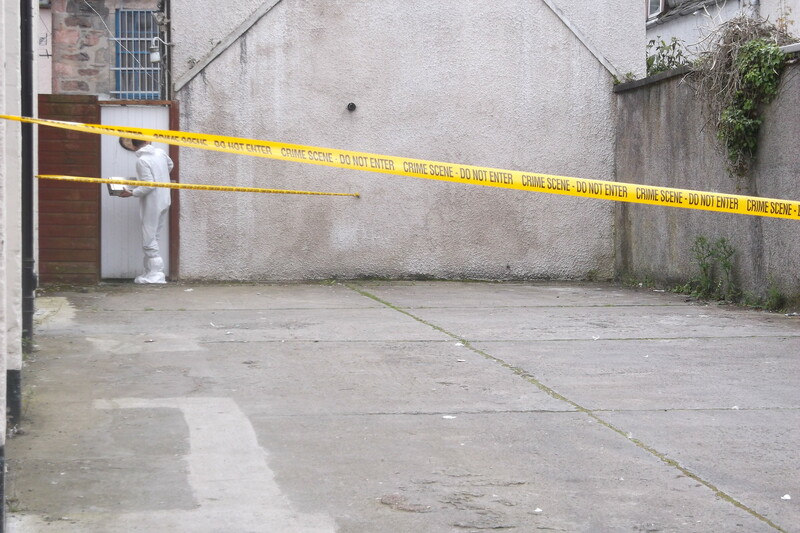 Police and forensics teams cordoned off a house in Inverness today following reports of a sudden death. The victim was named locally last night as Ian Goodwin, a former bar owner from the city. It is understood Mr Goodwin, who is believed to be in his 70s, was discovered dead in his home behind the loading bay at the Farmfoods store in Academy Street by a local woman. Officers set up a cordon around the cottage and loading bay while they carried out their investigations. Two forensics officers in white protective suits were seen carrying a box of equipment into the building today afternoon. Two police officers stood guard beside the cordon while colleagues carried out door-to-door inquiries at local pubs and other properties. The cordon was taken down later in the afternoon. A police spokesman said officers were called to the scene at around 12.35pm after reports of a sudden death. He said it was not being treated as suspicious. Mr Goodwin previously owned the Clachnaharry Inn in the north west of the city. Owners of the nearby Phoenix and Blackfriars Highland Pub said Mr Goodwin was a regular customer in their establishments.